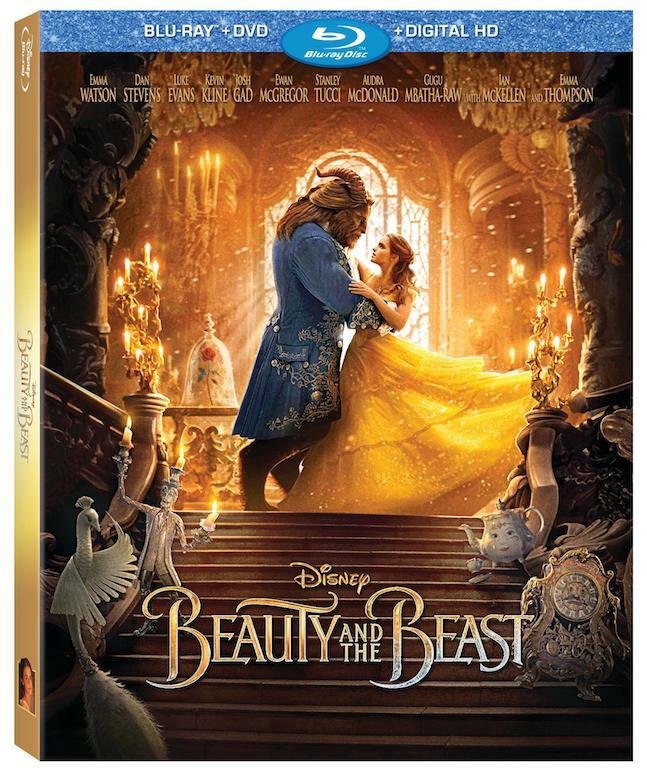 Beauty and the Beast will be available on Blu-ray/Digital HD June 6 with lots of behind-the-scenes bonus content! Get the details and pre-order your copy. Can I talk about how much I enjoy the live action Beauty and the Beast?! Emma Watson is stunning as a slightly modernized Belle, an inventor in her own right. But to be honest, the book-loving Belle has been an icon for girl power from the beginning. Dan Stevens plays a compelling Beast and it’s great to see some of his origin story and eventually see him open up and be vulnerable with Belle. And Luke Evans is 100% the Gaston we love to hate. And I have to give a massive shout-out to the star-studded supporting cast: Kevin Kline (Maurice), Josh Gad (LeFou), Ewan McGregor (Lumière), Stanley Tucci (Maestro Cadenza), Audra McDonald (Madame de Garderobe), Gugu Mbatha-Raw (Plumette), Hattie Morahan (the Enchantress), and Nathan Mack (Chip) with Ian McKellen (Cogsworth) and Emma Thompson (Mrs. Potts). The film is so entertaining, imbued with all the magic that we love in the animated film. Well, next month, we’ll be able to bring this beautiful, cinematic home! Beauty and the Beast arrives on Digital HD, Blu-ray, Disney Movies Anywhere, DVD and On-Demand on June 6. In addition to the original theatrical film, the home version also has a premiere cut with overture and a musical experience with a sing-along version. We can also learn more about the process of creating the film by going behind-the-scenes with Director Bill Condon and other filmmakers. Bonus content also include the first table read, a feature on the amazing women behind the enchanted tale hosted by Emma Watson; and over 10 minutes of deleted scenes and musical extras, including the “Beauty and the Beast” music video starring Ariana Grande and John Legend. (1) Enchanted Table Read – Join the cast for the movie’s elaborately staged table read, complete with singing and dancing to live music, set pieces and more. (2) A Beauty of a Tale – Explore the process of transforming a beloved animated film into a new live-action classic. (3) The Women Behind “Beauty and the Beast” – Emma Watson introduces several of the talented women in all aspects of production who helped bring this enchanted tale to life. —“Belle” — Filmmakers and cast reveal how it felt to shoot this memorable scene. —“Be Our Guest” — Discover all that went into creating this epic, primarily virtual performance. —“Gaston” — Join the cast for rehearsals and filming of this rousing, high-energy number. —“Beauty and the Beast” — You’re invited on set for the filming of this beloved, classic scene. —Introduction by Director Bill Condon — Director Bill Condon presents a collection of scenes that, for one reason or another, ended up on the cutting-room floor. —Gaston Courts Belle — Pleased with himself after settling a disturbance with the townspeople, a triumphant Gaston attempts to woo Belle. —Bread and Jam for Agathe — On her morning market rounds, Belle stops by to see Agathe, the village beggar woman. —Storming the Ice Gates — The angry mob of villagers, led by Gaston, overwhelms the castle’s defenses. —Lumière Torches LeFou — As the fight rages around them, LeFou scuffles with Plumette … until he experiences a sudden, extremely heated interruption. —Monsieur Toilette — LeFou escapes from the brawl into a small room, where he’s startled by a castle resident. —Cogsworth Rescues Lumière — When Clothilde the fishmonger threatens Lumière, Cogsworth leaps into the fray. —Treacle the Lasses — Three village lasses chase Chip and Froufrou – Madame Garderobe’s dog-turned-footstool – into the kitchen, where a surprise awaits. —LeFou and Monsieur Toilette Reunite — After the spell is broken and the castle residents are returned to human form, LeFou and his new acquaintance meet again. (7) Extended Song: “Days in the Sun” – Learn more about Beast’s childhood in an alternate version of this beautiful song, introduced by director Bill Condon. (8) “Beauty and the Beast” Music Video – Award-winning artists Ariana Grande and John Legend perform a moving version of this iconic song. (9) Making the Music Video – Go on set to capture the magic as it happens in Ariana Grande and John Legend’s “Beauty and the Beast” music video. (10) Disney Song Selection – Jump directly to all your favorite songs and sing along with the movie. Keep in mind that there are special, exclusive editions from Target (includes 32-Page Collectible Storybook), Walmart (includes real long-lasting enchanted rose), and Best Buy (includes Collectible Steelbook Packaging). Go HERE for more details and to pre-order you copy! Take a look at 15 images from Beauty and the Beast, including a some a look at some of the BTS moments featured in the bonus content.